While fibre optic internet coverage continues to grow, internet prices are continuing to decrease, meaning it’s never been a better time to upgrade your internet. That being said, if you intend on shelling out on fibre optic, its best you consider how you can ensure you make the most of what you pay for. If your internet supplier has not already provided you with a new wireless router, you may find the need to upgrade to make the most of your new high speed internet. Older routers on the whole tend to be around 50% slower than newer models, meaning investment is paramount if you want to make the most of your fibre optic connection. There is a huge array of routers on the market, with many different features. It’s advised that you go for a dual band router if you have many devices on your network as it will ensure a better connection that is less prone to interference. If you’re after the highest internet and data transferral speeds, connecting via an Ethernet cable is by far your best option. Wireless data is transmitted at a snail pace when compared to a cabled connection, which now has speeds of up to one gigabit on some routers, so really cuts down on the benefit of fibre optic broadband. Though far from practical, having a wired connection will enable you to really make the most of your internet connection. 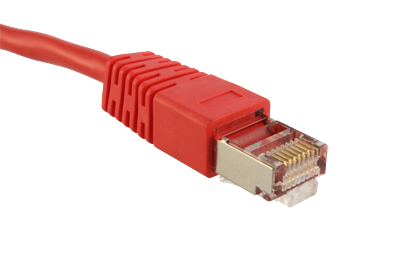 The end of a red Ethernet cable – the colour has no significance, red just makes for a more vibrant image! If you own a desktop, setup your router nearby so you can always have a wired connection for your PC. If not consider hiding cables in the wall throughout your home so you can have high speed connectivity throughout your home. If done right, it can even make your home more attractive when it comes to selling it! Modern hard drives now have functions which enable them to be used and accessed over your network, meaning you don’t need it to be plugged directly into your computer for it to work. Not only is this highly practical, it also allows multiple users to access information at the same time, without the need of cables. Many modern devices now have some form of use for wireless internet, so splashing out on the latest devices will mean you can really make the most of your fibre optic connection. Many consoles such as the Xbox 360 or the PlayStation 3 will allow users to stream content from the internet or computer onto the TV. With a high speed connection, you can have many devices operating at full pelt without feeling like your connection is being throttled. It’s better to get the best out of your broadband. Users don’t usually understand that making a few up-gradations to their existing connection greatly enhances the quality of internet available to them. Also, what do you think about Google Fiber? Used it yet? Plan to?